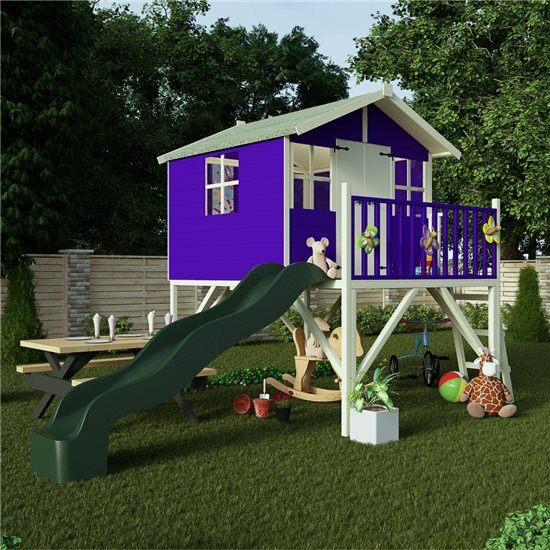 Wouldn’t you love to let your kids play in the backyard all day, and what better way is there, other than a playhouse, to keep your kids outdoors for hours? 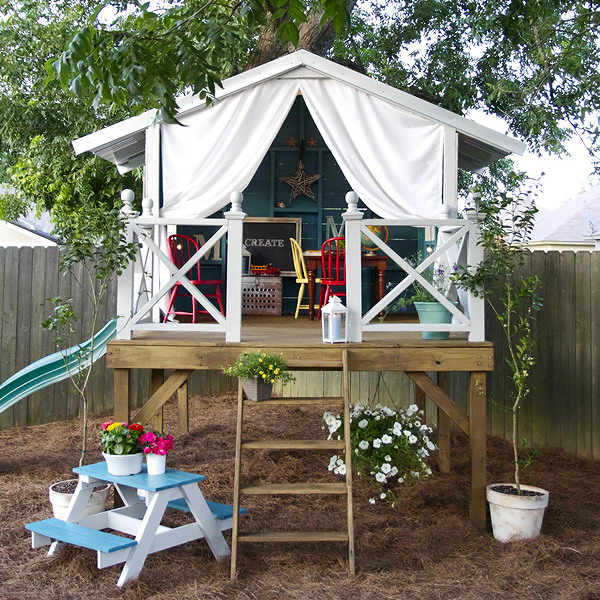 Here are the top 20 outdoor playhouses for kids. Some of these designs are relatively low cost, while others are quite expensive, so let’s explore the pros and cons of each design. 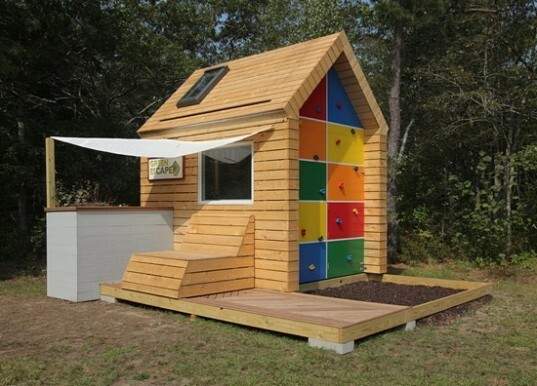 This playhouse comes at a price of about $7,600. It’s hand crafted and has a unique design. The exterior is ready to withstand bad weather while the playhouse as a whole will be in good shape for years to come. You are free to choose whatever color your child wants. After all, not every wannabe pirate is a boy. Girls might want a pink pirate place where to carry on their piracy related activities. The windows are round allowing children to pretend this is an actual pirate ship. Moreover, you can’t see them in this picture, but the house actually has a few scratches that are meant to be scars from previous cannon ball battles. The tower is accessed through a rock climbing wall on the outside. Princesses who don’t want to get through all this trouble will enter the castle through the door. The castle has a courtyard, a great hall accessed through the wooden door you see in the picture above and the tower with a secret room below that you can enter through the great hall. 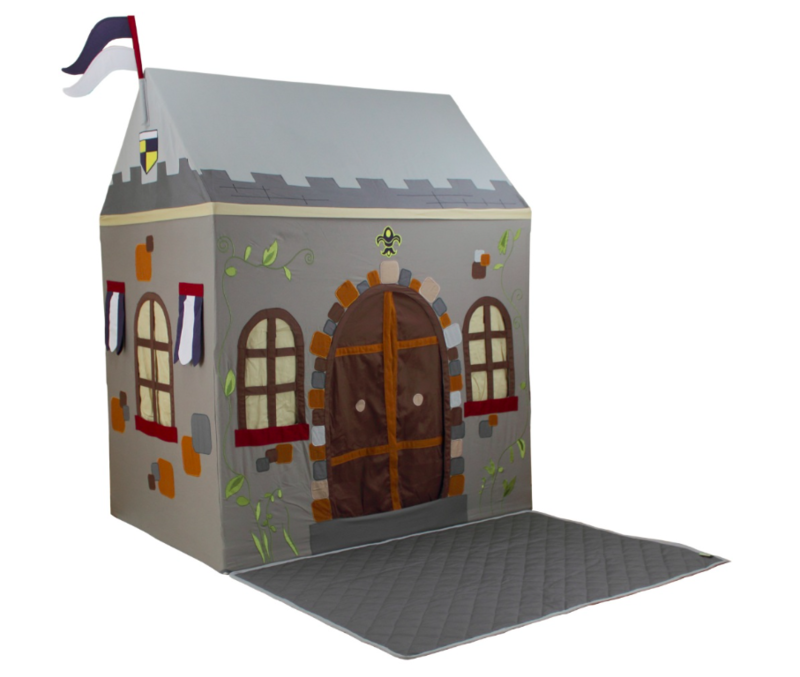 Your children will have a great time pretending to be knights in shining armors who defend the castle. The price is not low, but considering all that you get, it’s fair: $7,599. It’s important to note that in many cases it may be necessary to provide a site plan to obtain various home building permits from your city hall or township. You can turn to 24h Plans to get a custom site plan drawing prepared for your dream home in less than 24 hours by our team of experienced architects and drafters Use the promotion code: 24hplans-20off to get a 20% discount off any package. — Please note this is a limited time offer, exclusive to the readers of our blog. This offer is not being advertised anywhere else. 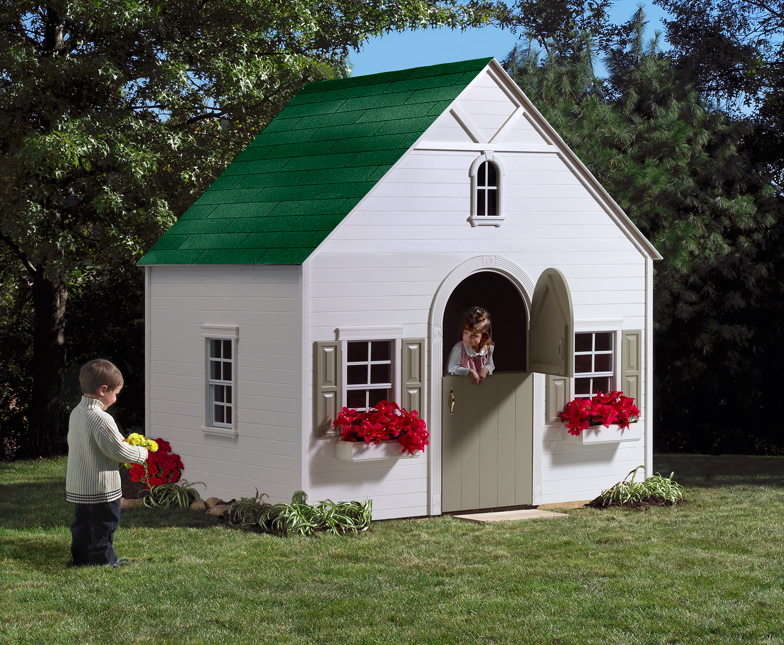 Here’s a classic playhouse that has a gable roof with green asphalt shingles. Inside, you will see the floor made of planks that were modified to look antique. The Dutch door is a quite distinctive feature that allows the child inside to check the identity of the new comer before he/she makes a decision about letting the visitor in or not. The playhouse was inspired from the cottages of the Cotswolds and it has an actual loft. You can get it in one of these 3 colors for a price of $4,999: extra white, stone lion, and shamrock green. The windows have blinds but they are not hinged as they are meant to remain open at all times. This will allow parents to check on their little children without actually having to go inside the playhouse. This colorful house is hand carved which explains the very high price of $89,600. It is fully waterproof, so you don’t have to worry about any weather related damages unless you leave in an area with strong winds. The windows are made of real glass and the Dutch door is made of oak wood. It has a sliding peephole, brass door knobs and it actually comes with weatherstrips installed. The furniture includes bunk beds with decorative railing, a small cupboard, a small leaf table with 2 drop seats, a mirror and a framed chalkboard. Here’s a unique design for children who enjoy to stay active. They can climb a wall or a rope net ladder, discover the secret escape routes and hidden ladders and do any other activities that children do in a regular playhouse. There also is a fire pole, a slide and a crawl tube that kids can explore. The designer used plenty of geometric shapes to make this playhouse more interesting to anyone who sees it. The house was sold for $50,000 at a fund raising event. 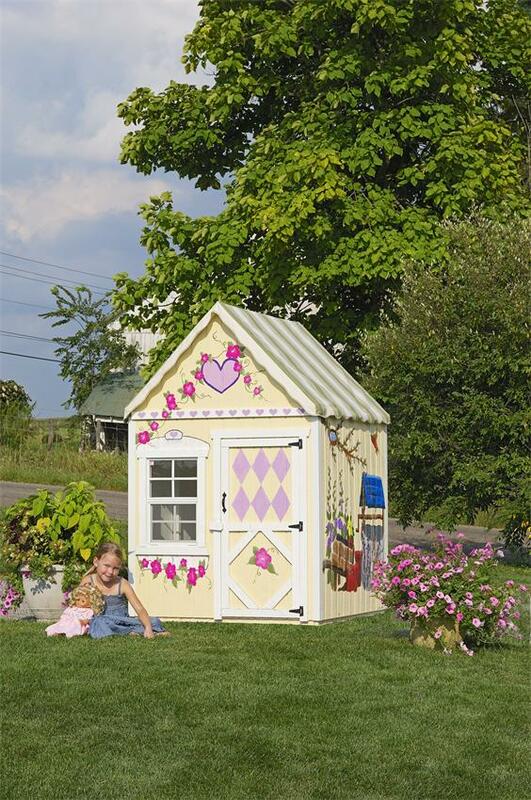 This is a cheaper but very cute playhouse for little girls. It is useless for rainy areas unless you have a big enough deck or a room to put it in. 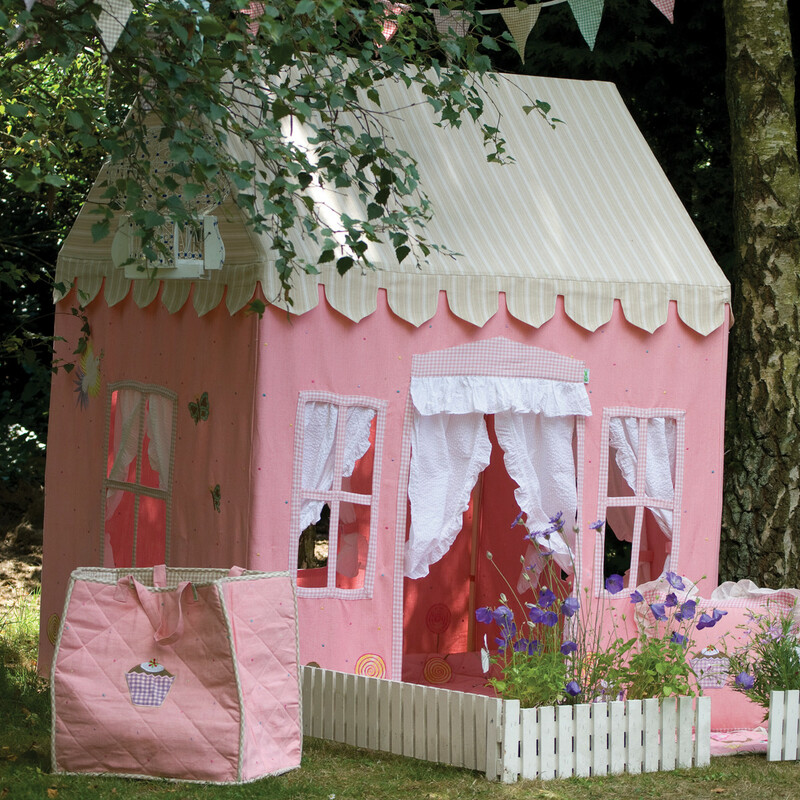 The playhouse is available for about $260 and is made of pink 100% hand-woven cotton. The playhouse is suitable for children who are at least 3 years old and the seller advises customers to move it inside after use. There are a couple of disadvantages: the playhouse is not resistant to mildew and it does not have an insect screen. 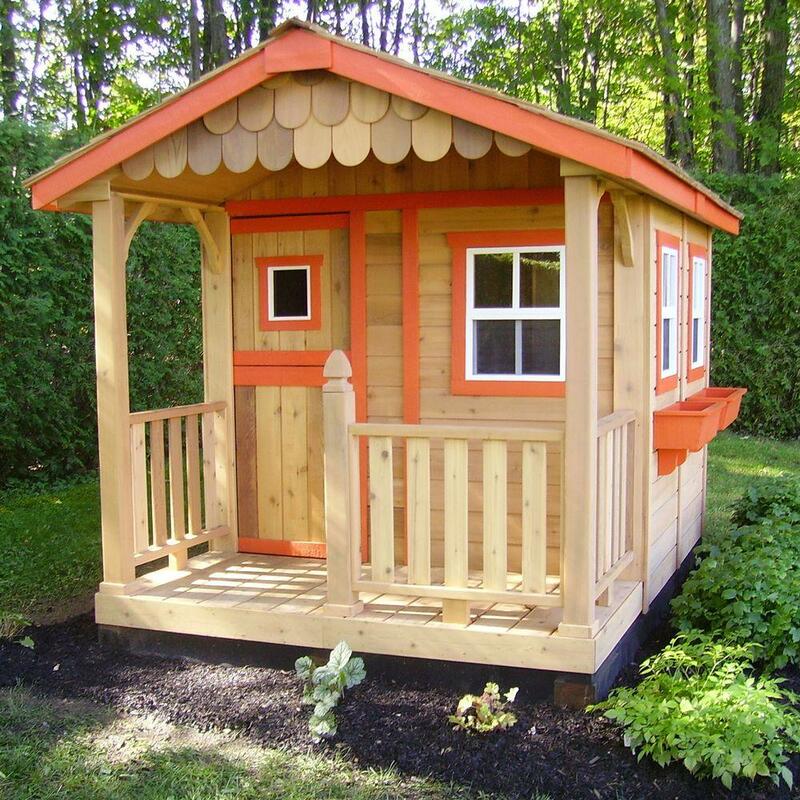 Measuring 6 x 9 ft., this playhouse costs roughly $2,524 and is made of western red cedar to give it strength and a pleasant look. The shingled gable roof adds style to the entire design while the porch makes it look like a real house. You can install the house on your own as it does not require special skills or tools. You can choose the finish that you desire so that it fits your own personal taste. The recommended age range is 3-10 years. The playhouse has a dutch door and 3 fully functional windows to ensure natural ventilation. Besides, the flower boxes look really nice. You have to buy your own flowers though. This playhouse has a solid sheet roof that was treated to keep water out, so you don’t have to worry that rain will cause any damage to the house. It comes with a floor that’s solid enough to allow children to run around without any fear of breaking. The panels are prefabricated to interlock together thus making the installation very simple. The playhouse has an all-round smooth finish and 4 fixed windows. The slide is included in the price but you will have to pay more if you want a bigger one. There are many colors you can choose from but the disadvantage is that the sellers do not paint the house. They just give you a tub of paint to do it yourself. In fact, you are not even required to buy the paint from them if you don’t want to. The house comes unpainted and you have to pay extra for the tub of paint. The price starts at roughly $450. Sold for about $650 on eBay, this playhouse is made of pre-stained natural cedar wood and it measures 74″ L x 65″ W x 67″ H. This Victorian style small playhouse has a front porch a bench and a serving station. Inside, you will find a telephone, kitchen utensils and appliances as well as a few Velcro food items. It also has white plastic pot holders and bay windows. The wood proved to be resistant to mildew and natural decay. 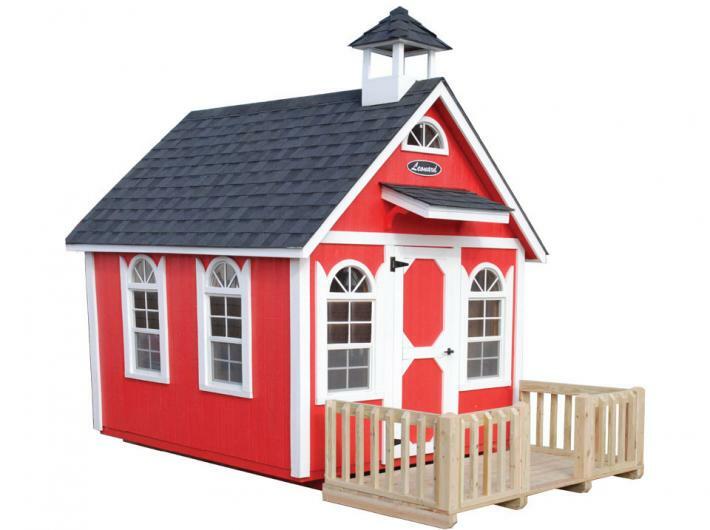 Available for the price of $245, this item gives you a cheap way to provide a fun playhouse to your children. It may not be made of wood or any other durable material, but it certainly brings a lot of fun. The playhouse has a metal frame covered by a cotton canvas. The windows and the door have separate curtains. 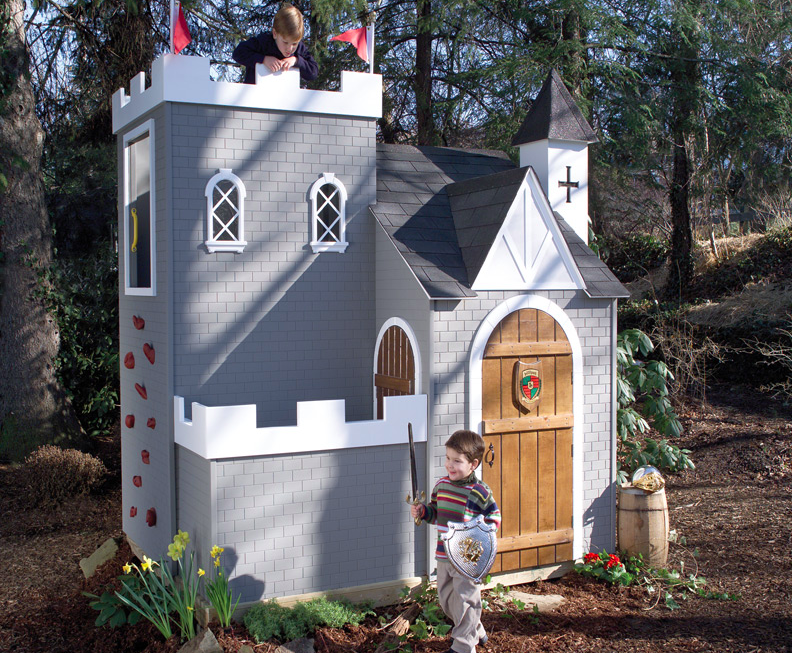 The playhouse is suitable for both boys and girls ages 3-6 years, as per the seller’s recommendations. It is intended mainly for indoor use. If you want to place the playhouse outside, it would be best to do it on a porch or a covered deck/pergola to protect it from intense sun rays and rainy conditions. Reminding you of the old American times when young women and men sit on the porch to have interesting conversations, this playhouse looks a lot like a real house in miniature. If you didn’t have the children in the image for scale and the picture was taken from a different angle, you would mistake it for the real deal. The playhouse has 2 working windows, 1 dutch door children and one for adults. The porch has wooden railing and there is a floor inside. The beautiful flower boxes at the windows, the white porch and the design of the roof are classic for American houses. The price of this beauty is $3,432 and it includes lift-gate delivery service. Unfortunately, the price does not include the paint, roof edging and the shingles. 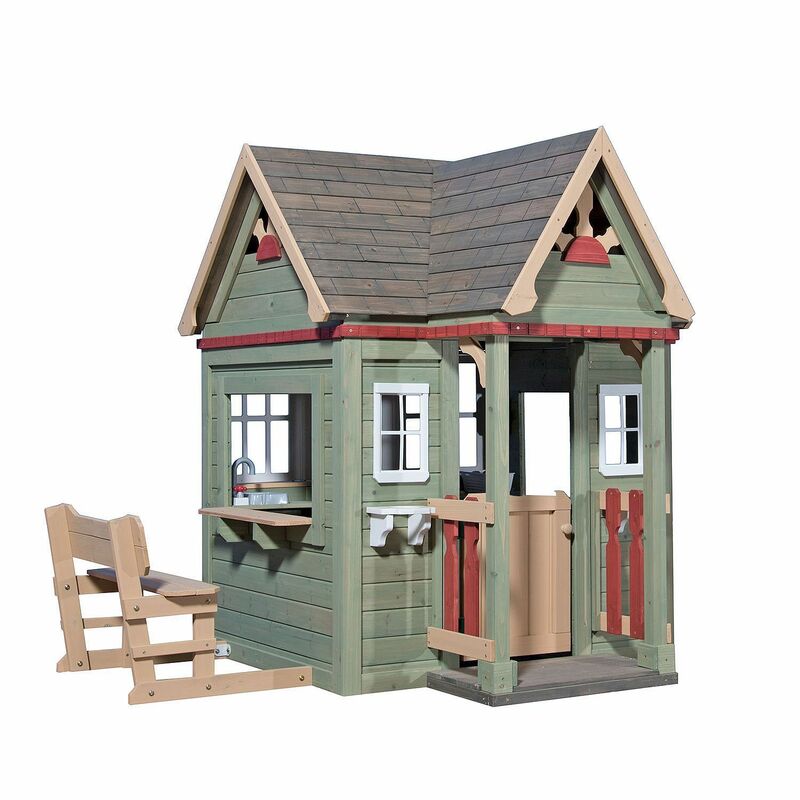 This playhouse has a simple gable roof and a porch where kids can play. You have the option of choosing whatever color you want and of making slight changes like adding or removing windows, changing the door style, or insulating the house for outdoor use in colder climates. The size is 8 x 10 ft. Thus, being suitable for most backyards in America. There aren’t any special elements that stand out at this design, but the playhouse is nonetheless a perfect place for kids to play school. 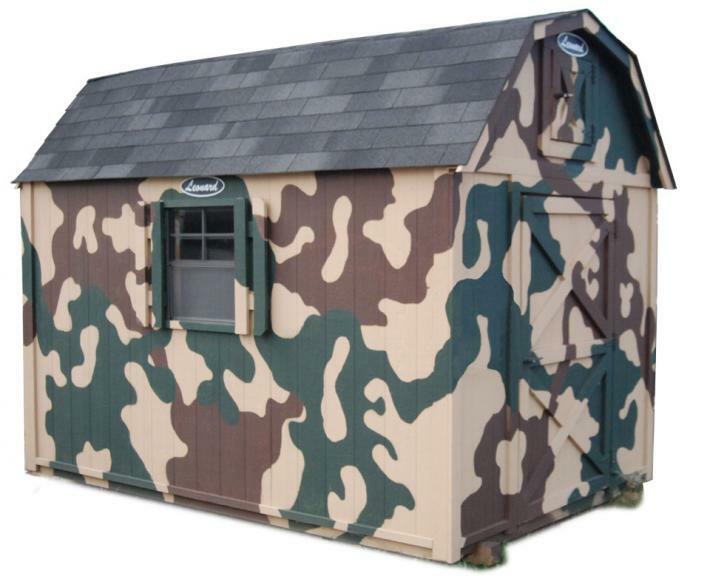 Boys will love this playhouse especially if they enjoy playing with toy soldiers and toy guns. Anyway, who says a girl can’t like playing with so called “boy toys?”. This could be their headquarters where they plot on how to annihilate the opposite team. Kids who have a hunter in the family might also enjoy this design especially because it allows them to pretend they are hunters themselves. The interior is very spacious and the roof is similar to the one of a barn. There are a few secrets for children to discover by themselves, so don’t tell them in advance about the trapdoor in the door where you can hide treasures. This was a DIY project that Ashley and Jamin (check out the website) took upon themselves to build in their backyard. You don’t need highly trained carpenters to pull this off. If you decide to build it yourself, make sure to build a solid ladder. If you are not confident in your abilities to do so, it’s best to hire professionals for this job. The white canvas can be used as an insect screen at night as long as you add a lamp inside. Kids can have their own tea parties and horror story telling sessions inside their playhouse. They can even do their homework in there if you provide electricity. 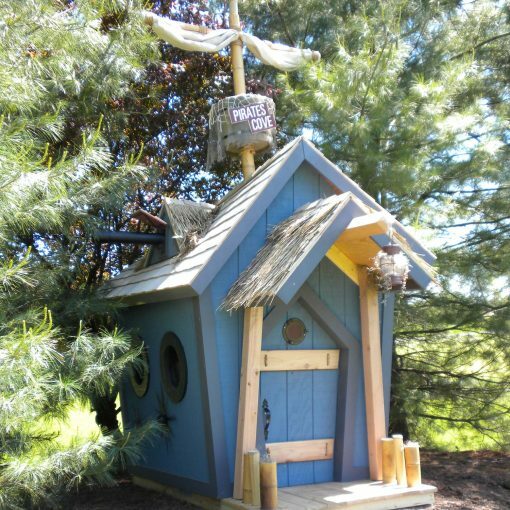 The roof offers shelter from rain and heat, so the playhouse is perfect for both hot summers and rainy springs. 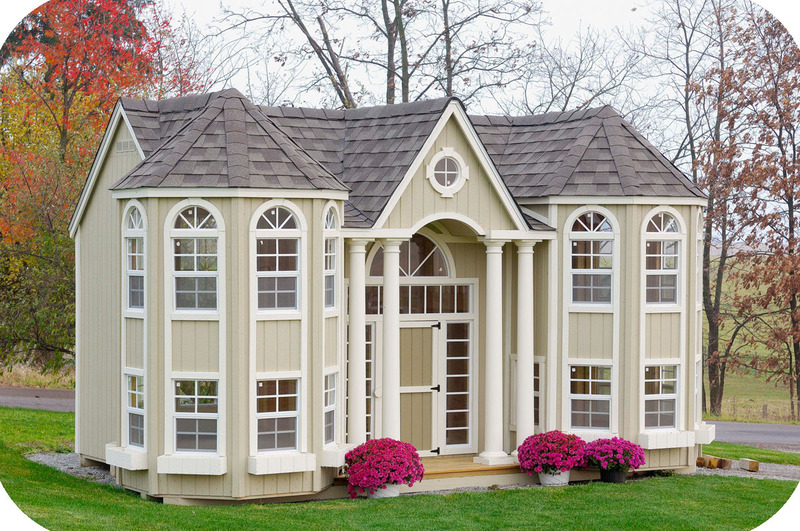 This playhouse measures 10 x 16 ft. and was meant to display classic and fancy architectural features. There is a loft inside accessible through a ladder. The house itself is entered through the front child door and there also is an adult sized french door. The flower boxes are included into the package but you have to pay more for roof shingles and the paint. Your children will be able to pretend they are nobles who live in a mansion and have fancy tea parties with important personalities. If you want to buy the DIY kit, you will pay around $9,000 while the pre-built version costs $13,000. 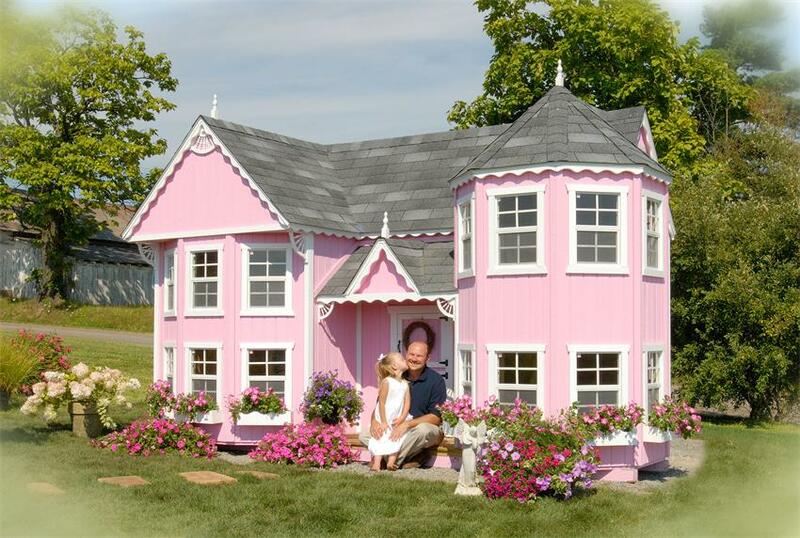 This design is perfect for little girls who want a house like princesses have in fairytales. The price starts at $4,906 and it comes as several wall panels with high quality siding. The house has a fancy Victorian trim, a loft with an interior ladder for the turret side and of course a dutch door for children. It has an impressive number of 17 working windows with safety glass, grids and screens. Some flower boxes are included into the price but you can pay an extra fee if you want more. 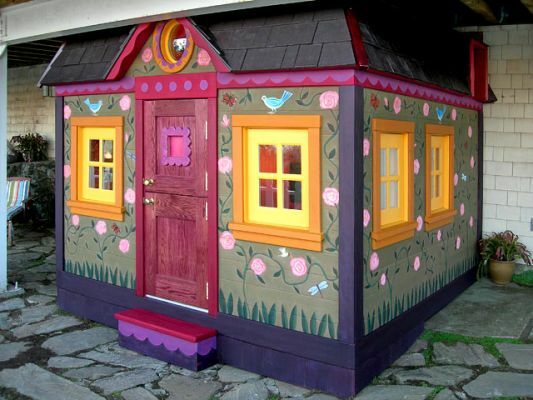 Available for a price of $1,061, this playhouse is perfect for little girls who want a place to play with their dolls. It comes with its own floor and it’s shipped as pre-fab panels to ensure a smooth installation. The walls have Duratemp siding, while the roof is made of canvas, which might be a disadvantage, if it rains a lot in your area. You could place it under a covered pergola to solve this issue. It has 1 working window with safety glass but you can install more if you want. This is a special and quite pricey playhouse that actually comes with its on tree. Yes, you don’t need a tree in your backyard to have this installed. The price starts at $15,485 and it goes up if you want upgrades like a fake brick chimney, a tire swing or monkey bars. The tilted windows, the way they built the roof and the position of the white planks make you think that the house comes from a cartoon world thus making it so much more interesting for children. The tree log is hollowed inside and it has a ladder that leads to the actual house. This is a perfect place for secret club meetings. The slide, the porch, the trap door and the balcony are included into the base price. 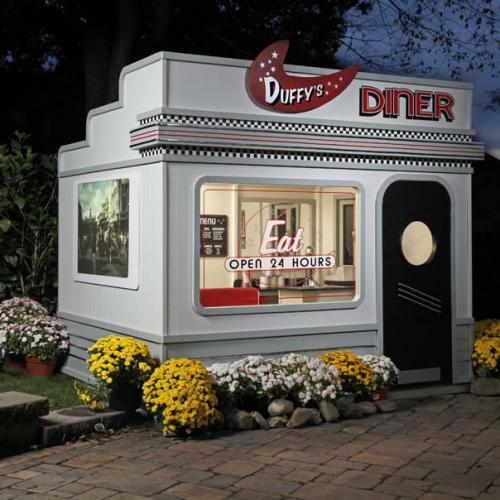 This 50’s style diner playhouse is available for $7,999 mainly because of its unique theme. It teaches children a bit about the old times thus creating a great excuse for grandparents to spend time with their grandchildren telling old stories. They can pretend to cook and serve food and you can even add electricity to the house so that they can plug in toys and smart devices or to play after the sun sets under adult supervision, of course. The playhouse is very similar to classic American real diners, starting from exterior shapes to interior design elements. It is shipped as pre-fab panels that take a few hours to assemble. The exterior is waterproof, so you don’t have to worry about it getting wrecked by rain. 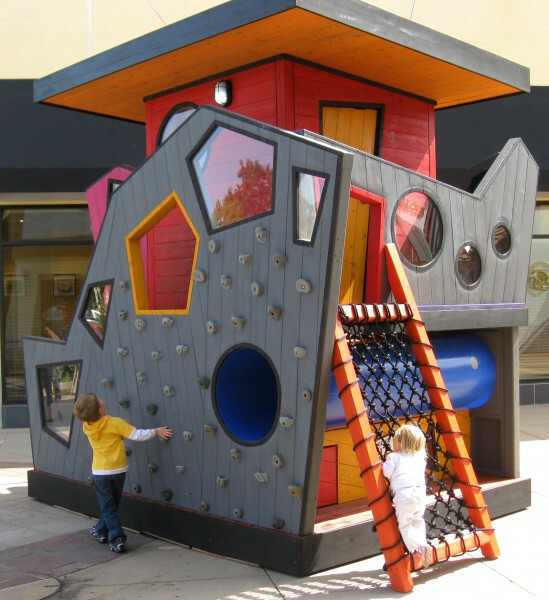 Here’s a modern playhouse design that’s meant to be a backyard retreat for children. The wooden boards withstand bad weather, so they are suitable for rainy areas as well. You can see the climbing wall on the outside. This will give them an opportunity to stay active and have lots of fun at the same time. As for the inside, there really is no reason why children would ever leave this playhouse. There is a big blackboard where they can draw with colored chalk. There is plenty of room to add some small chairs to play board games on a little table and there is a ladder that leads to the loft where they can play with toys. This is a real clubhouse suitable for little kids and middle schoolers alike. 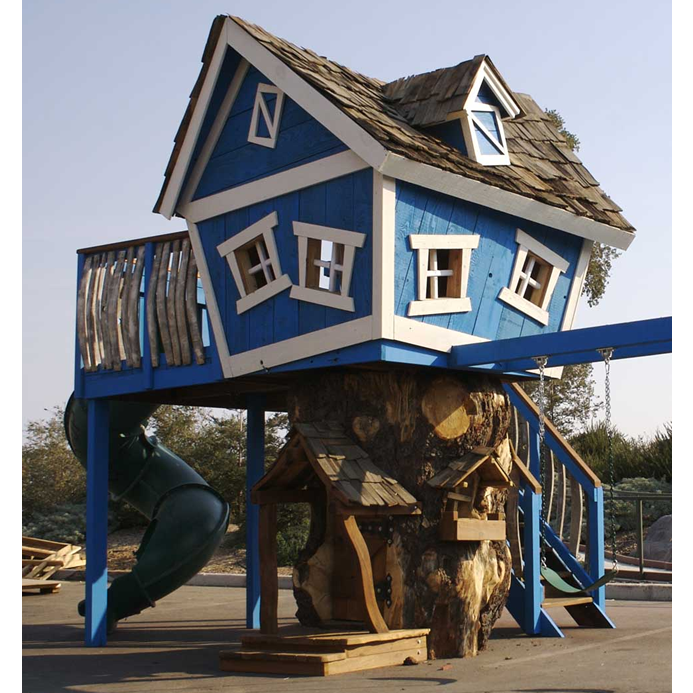 Some of these playhouses look better than a lot of real homes you see in today’s neighborhoods. It’s true that most of them cost thousands of dollars but that’s mainly because manufacturers tried to make house miniatures, not just toys for children to play in. However, this does not mean you should give half a year worth of rent on a playhouse if you can’t afford it. Your kid will be happy with the cheaper version too as long as it stimulates his imagination.